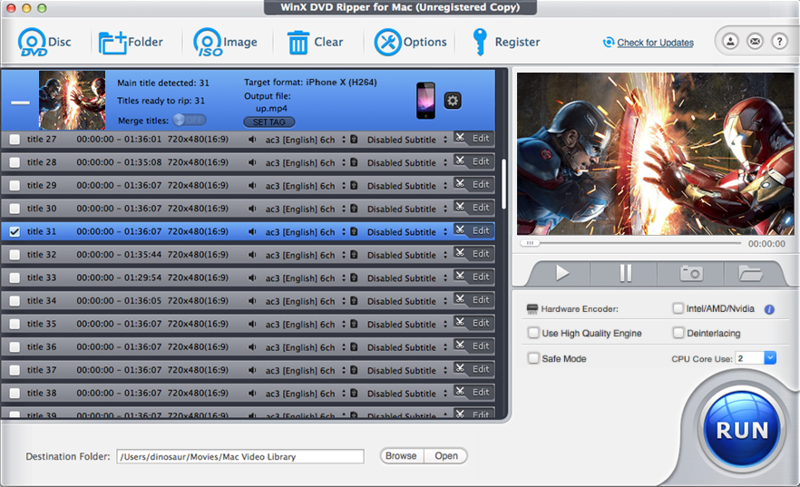 WinX DVD Ripper for Mac is an all-in-one DVD ripper designed to make perfect 1:1 DVD copy to hard drive and rip your DVD movies on Mac OS to iTunes, MOV, MP4, FLV, etc that playable on iPad, iPod, iPhone, Apple-TV, PSP and much more. WinX DVD Ripper for Mac also supports extracting music from the DVD files and saving as MP3 format. With this Mac DVD ripper, Mac users could backup DVD collections to Mac or portable devices without any quality loss. WinX DVD Ripper for Mac is also able to can rip DVDs of new generation DVD copy protection technology, such as The Princess and the Frog, Alice in Wonderland, Transformers 2, Star Trek, etc.